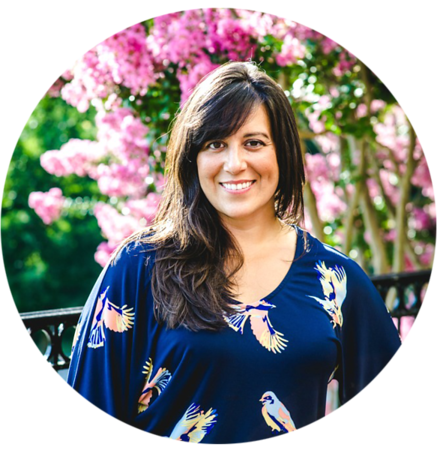 The BoldHeart Mama is at her best—for herself and for her family—when her thoughts, energy, and daily rhythms are aligned, and when her basic needs are met. Every day the BoldHeart Mama has an opportunity to reconnect with her authentic and true self, in all her varied roles, through the five BoldHeartMama Anchors: peaceful (Parts 1 and 2), connected, nurtured, purposeful, and inspired. Nature is a core element in the BoldHeart Life. The BoldHeartMama Anchors are a set of core desires that when met help the BoldHeartMama to feel satisfied and whole. This is one in a series of posts expanding on the BoldHeartMama Anchors. I want to feel a sense of peace about the long and short-term decisions I make in mothering my kids, and in the ways that I invest my resources of time, energy, and money. I also want to enjoy a more literal peace and harmony in the daily home life that I create for my family. 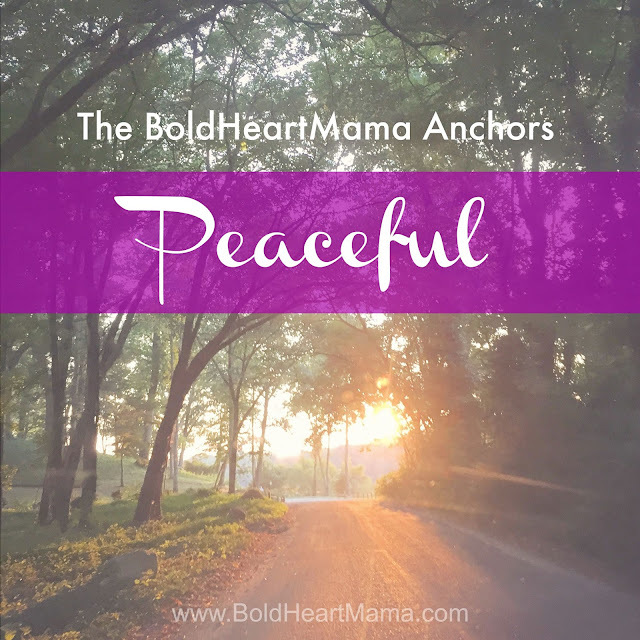 Today I’m sharing Part I of the Peace Anchor: finding peace in the decisions I make for myself and for my family. This approach to decision-making expands to a philosophy that calms those nagging worries and fears that change and commitment tend to bring out in me. It lessens the unnecessary stresses I create for myself in seeking out a sense of control. My former approach to solving problems and making decisions was to take a look at the big picture, focus-in on a desired outcome, and then break down the steps needed to get from here to there. With a plan in hand and some wiggle room for the unforeseen, I could follow the map I'd drawn and make revisions as needed, while continuing forward progress toward my goal. This very practical approach offered a way to feel organized and a nice sense of control as I tackled each step, yet it required me to map out a path in advance and stick to it. Now that I'm a mother with a family to care for—and many different perspectives to consider with multiple variables and needs to address simultaneously—decision-making isn't quite so straightforward. Some decisions feel complex or with great consequence, and the added responsibility to choose the "right" answer or path can be overwhelming. Over the years I've adopted a new approach to addressing life's big decisions that is largely about letting go, living in the moment, and taking it one step at a time. I simply want to enjoy my experience as a mother and to make the most of this one life I have, and I want the same for my family. I don’t want to spend my time and energy ruminating and planning for every permutation of a given scenario for fear of a lost opportunity or a wrong turn—even for the decisions that feel like really big ones. It is a waste of my time to invest my energy in solving problems I don’t yet have. I understand that family life can be demanding and that it is often necessary to look ahead in order to anticipate everyone's needs and wants and to begin to make plans for those things as we move into new seasons of the year and of our lives. Having a desired outcome can be helpful for guiding priorities and investments of time, energy, and money, and while I appreciate the usefulness of working toward something specific (a tangible feeling, accomplishment, or outcome) it’s another thing to be so focused on mapping out in advance our plans of action—or to become so rigid in carrying out our plans—that we miss out on the synchronous opportunities that often happen in the moment, and the magic happening right in front of us. I embrace thoughtful dialogue with myself and with my husband, and others in my circle, about what is important to me. I enjoy the iterative process of checking-in in this way to assess what’s working and what’s not working, and also to invest time in considering the best ways to move forward. I've learned to stay open to all the possibilities. And I really mean ALL of them, even the ones that don't seem all that possible or realistic. Don't let your own high standards or the expectations of others limit your imagination. Be honest. What do you really want or need right now? What does your gut say? Listen to that first. There are creative ways to make all things possible. One thing I’ve learned in the last few years is that sometimes (okay, a lot of the time) it’s only really necessary to take just ONE small step in a direction. ANY direction. It's true. Right now, that’s really all that’s needed. I don’t have to be certain in this moment what will come three steps ahead. Sure, wouldn’t it be great if we could know? But, seasons change, feelings change, people change, and our lives are ever-evolving. What we thought was true or right in one moment may not be so after we dig deeper to learn more, or after we sit with our decisions for a time to see if it really is the thing we thought it could be, or to observe if we feel the way we thought we might. If the step I take is in the right-for-me-and-my-family direction I will know it. If the step I take is in the wrong-for-me-and-my-family direction I will know it. Either way, I get the opportunity to receive some feedback—whether a gut feeling, a new idea, a shift in perspective or family dynamic—and then I can take one more step in any direction I choose. Intentionally choosing to address only what is right in front of me allows me to stay in the moment of now, to try out new ideas, and not get weighed down with the notion that I must choose the absolute best decision right from the start. Sometimes we're not certain what is best. Choosing to address what is right in front of me relieves me of the burden and pressure and stress of figuring everything out before I even make my first move, or worse—sticking with a plan that no longer serves me. This kind of restraint to stay in the now can be tough. When I feel doubt creeping in or anxiety ramping up I often have to remind myself that I can't really go wrong. Nope. Not really. This life is made up of the trying and failing and trying again, and all that we learn about ourselves as we do the work. My plans are always as of today, because I give myself permission to change my mind if I change my mind, and to deviate from plan or adjust my goals whenever life calls for it. I continue to get better at being totally OK with that. It's truly less about giving up, and more about letting go. Sometimes I feel guilt and unease sitting with the not knowing, and that's when I have to take a pause and let it sink in that few choices are permanent. There is always tomorrow, or fifteen minutes from now. I can change my mind again or continue to make the smallest deviations to right our little ship and stay on course. I find peace in this approach because I am free to follow my heart, to make mistakes, to change my mind, let go, and admit that I don't have all the answers and that I can't know for certain how it all turns out in the end. How do you find your peace? Would this approach work for you? YES! I love this, Jacqueline. I need to be better about letting go, being more aware of the fact that it's okay to change my mind and go a different direction, and being at peace with our decisions. This was the summer of big decisions in our household and it is exhausting! I think decisions seem so much more daunting once you are a parent because you aren't just making decisions for yourself, but for these little humans that depend on you for so much and you really don't want to let them down. It weighs on me heavily. Even just silly things, like this fall I decided that we aren't doing any extracurriculars (besides piano lessons in our own home) because the kids have enough to adjust to with new schools, new friends, Lilah's first experience with full day school, etc… But MAN I can't even tell you how many times I've had to say NO to people trying to recruit the kids for dance, soccer, gymnastics, etc, etc… I find myself second guessing my decision and wondering if I'm doing them a disservice by keeping them out of extracurriculars for a season. In my heart I know it will be best for them and our family to have more downtime during this adjustment period, but I have to keep reminding myself of that. I know that it is unlikely that taking one season off from organized activities is going to have any long term effects of them, but it feels like such a big decision right now (and, generally speaking, is seen as odd or even unheard of by others). Annnyway, thanks for this post. It really resonated with me on so many different levels. As homeschoolers I get a lot of input (opinions and recommendations) from others about what the boys should be doing. I've been resisting diving into all of it for reasons that have some to do with the kids and some to do with me, but we're keeping it low-key this year, especially the first half because I'm just kind of waiting to see how it feels as we get back into our rhythm together and as the boys continue to mature and have genuine interest in participating. It can be hard to choose the "odd or unheard of" thing when it feels like you are the only one and you're not really sure what effect it will have or what the consequence might be. Like you, I feel confident it is what's best for us collectively right now, but I often think about how my decisions directly impact their world and sometimes worry they are missing out. But, then I figure that there will be PLENTY of time for all of that "extra" and "busy", and know that it's ok to take it slow and make decisions on a case by case basis. Oh, you speak my truth here! I Know this way of living and I love it. I have found that since approaching life and living in this way, I am much calmer and more at peace, bot within myself. When I deviate from checking in with myself and ensuring I remember it's *this* moment before the next and I almost always have options and can change mymind anytime, I'm much worse off. Absolutely! We are all a work in progress. Our relationships and our desires create a constant demand for growth and a constant evolution to adapt and be our best selves. It's overwhelming at times and exciting! Thanks so much for stopping by.